Bram Stoker’s tale of Dracula is retold with a contemporary Los Angeles setting. In modern day Los Angeles, Dracula poses as businessman Vladimir Sarkany. After his offer on a property is rejected, Dracula attacks realtor Petra Hawkings in a parking garage. Realtor Jonathan Harker shows Dracula/Sarkany and his assistant Renfield an empty building for sale in a rundown area of the city. Outside, they are accosted by gangbangers, but Dracula hypnotizes them and they leave. Sarkany offers to buy the property. Jonathan celebrates the sale with his wife Lina Harker. The celebration chills when the couple clashes on the subject of starting a family. Meanwhile, the gangbangers return to the empty building and Dracula kills them. Jonathan brings the paperwork to Sarkany’s house. Inside, Jonathan sees a painting that he believes resembles his wife. Dracula becomes enchanted with Lina when Jonathan shows him a picture of her on his cell phone. On the drive home, a frantic Quincy Morris appears in Jonathan’s backseat. Quincy raves that Sarkany is a monster that killed his girlfriend, realtor Lucy Spencer. Jonathan dismisses Quincy’s mad tale and takes the man to the police. The next day, two detectives arrive to interview Sarkany, but Renfield asks them to return in the evening. Jonathan takes Lina to Sarkany’s mansion so that she can see the painting. While there, Lina falls under Dracula’s spell. On the drive home, their car breaks down and Jonathan and Lina are forced to sleep in the woods. Dracula attacks during the night and Lina wakes with bite wounds on her neck and on her arm. Back at Sarkany’s mansion, Dracula hypnotizes the LAPD detectives. Because of her sudden lightheadedness, Jonathan takes his wife to see Dr. Joan Seward. Test results reveal that Lina is anemic. Outside, Quincy finds Jonathan and tries convincing him that Dracula is a vampire. Quincy asks Jonathan to join him and Van Helsing in destroying the creature, but Jonathan does not believe Quincy’s story. After Jonathan leaves, Renfield runs over Quincy with his car. Jonathan comes home to find Lina eating their dog Bailey. He calls Dr. Seward and also begins reading the Van Helsing journal that Quincy gave him. Jonathan eventually teams up with Van Helsing while Dracula kidnaps Lina. Van Helsing is forced to kill the glamoured detectives when they come to arrest Jonathan for Lina’s supposed murder. He and Jonathan track Dracula to the abandoned building that Sarkany purchased. After Jonathan rescues Lina, Van Helsing goes to drive a stake through Dracula’s heart while the vampire sleeps in his coffin. Dracula awakes and kills Van Helsing. Jonathan manages to kill Dracula. However, Lina becomes a vampire and kills her husband. She is last seen moving into Sarkany’s mansion with Renfield as her servant. 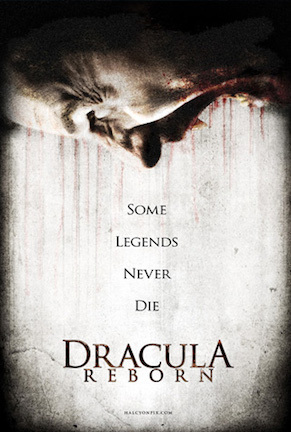 “Dracula Reborn” is another cinematic retelling of Bram Stoker’s venerable novel. Writer/director Patrick McManus’ treatment of the material transplants key brushstrokes of the 1897 literary classic into modern-day Los Angeles with the infamous vampire posing as businessman Vladimir Sarkany. Unfortunately, McManus brings along the outdated pacing and dry drama for a version of the too familiar tale that has a 21st century setting, but 19th century storytelling. Several of the tweaks that “Dracula Reborn” makes to the original story are limited to changing genders of ancillary characters and adjusting their names in turn. Jonathan Harker’s boss Peter Hawkins is now an attractive female named Petra Hawkings. Dr. John Seward becomes Dr. Joan Seward. Mina is renamed Lina. Minor pawn moves like these are not enough of a derivation to earn a nod for cleverness, and they are not enough of an update to make a difference in the final product. Harker thinks Dracula's painting looks "exactly" like his wife Lina. If I were her, I'd question his eyesight. Stoker’s book may be the nucleus of all vampire fiction, but its effectiveness is entrenched in the era in which it was written. Which is why if the story is going to be updated yet again for a new audience, something has to change besides places and names. In particular, the rhythm needs refreshing, and the atmosphere should make full use of the Hollywood relocation. But “Dracula Reborn” hooks itself too firmly around the real estate deal between Dracula and Jonathan Harker. In fact, the screenplay centers more on the relationship between Jonathan and Lina than it does on the count’s association with either. As a result, story momentum is bogged down by movie-of-the-week melodrama while the Harkers strain their marriage with talk of starting a family. When the focus does shift to Dracula, the film features insomnia-curing scenes of Harker preparing paperwork, Dracula reviewing paperwork, Dracula signing paperwork, and myriad other tertiary activities related to closing a business transaction. The schlubby guy on the right is supposed to be the model on the left's boyfriend. Yeah, right. Petra wanders around a parking garage. Harker examines a vacant warehouse at length before selling it to Dracula. He and Dracula then wander its empty halls together. Later, Harker and Van Helsing explore the building again while searching for the count. A modernized “Dracula” needs to trim such empty drudge and replace it with an ambience reflecting contemporary sensibilities for plot advancement. Dracula himself echoes the plodding nature of the film. Stuart Rigby attempts to play Dracula with the type of hypnotic aristocracy and stoic confidence that the character exudes in so many onscreen portrayals. But everything about the film develops at the rate sand turns into diamonds, putting Dracula’s existence in a state of perpetual slow motion. His mannerisms are so deliberate that Dracula unintentionally resembles a stone statue. The audience is left annoyed at having to wait so long for him to do something as mundane as to respond during a conversation. Six of the seven times Harker looks over his shoulder in the same scene. We get it. He's scared. As a dreaded menace, Dracula also comes off as blasé. Early scenes have him getting off on appearing out of nowhere to startle people from behind or to cast shadows over their shoulders. A brief flash of inspiration comes when Vlad squares off against a trio of L.A. gangbangers, but it is a short-lived moment. Dracula then resumes his odd habit of slaying real estate agents. Harker is the third such broker targeted in a short period. Dracula is going to have a hard time keeping a low profile once the agency realizes everyone assigned to this client ends up as a corpse or as a creature of the night. “Dracula Reborn” was never going to knock off socks as a must-see version of the story, although it does possess decent digital FX work and an okay look for this level of production. Aside from giving the locale a facelift, the film is a misfire in terms of revitalizing, much less improving, a 100-year-old tale for modern interests. And in the bursting-at-the-seams sub-genre of “Dracula” adaptations, okay and mediocre may as well be adjectives synonymous with unmemorable and pointless. "Dracula Reborn" actress Victoria Summer and Michele Hicks of "The Shield." 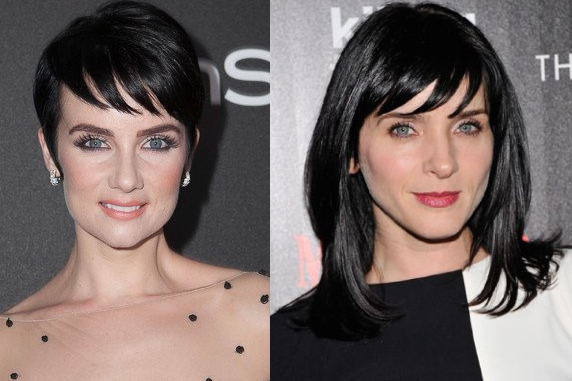 Separated at birth? December 17, 2013 by Ian Sedensky.